Salmon Entree: Chicken Broth, Salmon, Chicken, Chicken Liver, Meat By-Products, Poultry By-Products, Tapioca Starch,Vitamins and Minerals, Natural Flavour, Sodium Tripolyphosphate, Colour, Fish Oil (Preserved with Mixed Tocopherols), Xanthan Gum, Salt, Taurine, DL-Methionine. Chicken Entree: Chicken Broth, Chicken, Chicken Liver, Poultry By-Products, Meat By-Products, Tapioca Starch, Natural Flavour, Vitamins and Minerals, Sodium Tripolyphosphate, Colour, Fish Oil (Preserved with Mixed Tocopherols), Salt, Xanthan Gum, Taurine, DL-Methionine. 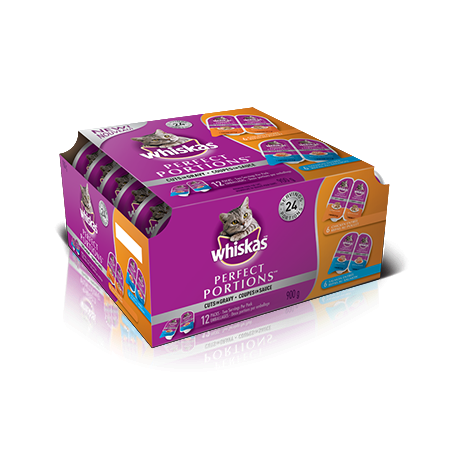 WHISKAS® PERFECT PORTIONS™ CUTS IN GRAVY SALMON AND CHICKEN ENTRÉE ARE FORMULATED TO MEET THE NUTRITIONAL LEVELS ESTABLISHED BY THE AAFCO CAT FOOD NUTRIENT PROFILES FOR ALL LIFE STAGES.